It is the closest national park to Arusha town – northern Tanzania’s safari capital. Arusha National Park is a mult–faceted jewel, often overlooked buy safari goers, despite offering the opportunity to explore a beguiling diversity of habitats within a few hours. 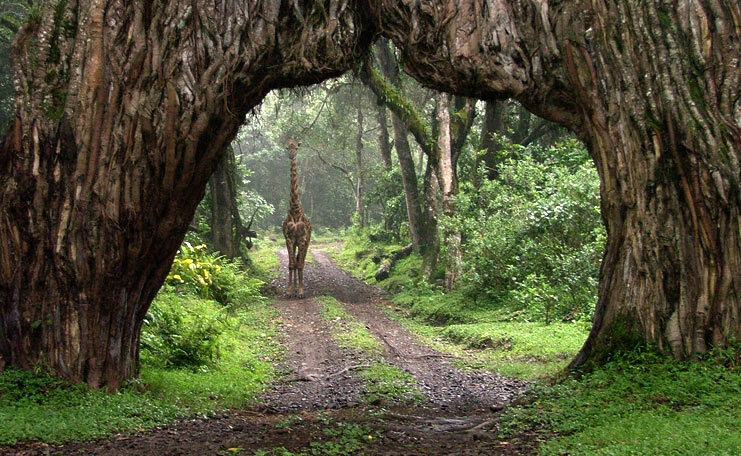 The entrance gate of Arusha National Park leads into shadowy montane forest inhabited by inquisitive blue monkeys and colorful turacos and trogons. It is the only place on the northern safari circuit where the acrobatic Black and White Colobus Monkeys can be easily seen. In the midst of Arusha National Park forest stands the spectacular view of Ngurdoto Crater, whose steep, rocky cliffs enclose a wide marshy floor dotted with herds of buffaloes and warthogs. Arusha National Park covers an area of 552 square kilometers which is equal to 212 square miles. Arusha National Park is located northern Tanzania, northeast of Arusha city center. It takes about 40 minutes drive from Arusha town. It is approximately 60 kilometers equivalent to 35 miles from Kilimanjaro International Airport. The lakes, forest and Ngurdoto Crater can all be visited in the course of a half day tours outing at the beginning or end of an extended northern safari. NOTE: Mountain Climbing permits duration time is twelve hours. Day walking safari, numerous picnic site, you can also climb Mount Meru for three or four days which is the best acclimatization for Mount Kilimanjaro climbing. Arusha National Park can be visited all year round but to climb Mount Meru should be from June–February although it may rain in November. It offers the best views of Mount Kilimanjaro in December through February. Morning’s picks up from Arusha at 8:00am and then start your day trip to Arusha National Park; the terrain of the park ranging from open savannah through acacia scrubland to Afro Mountain cloud and rain forest and Afro–alpine vegetation similar to Mount Kilimanjaro. There are several alkaline lakes and the spectacular Ngurdoto Crater. Mammal species include elephant, buffalo, various primates, giraffe and leopard. Hiking is allowed if accompanied by an armed guard and the climb up to Mount Meru is superb, often giving the best views available of Mount Kilimanjaro. At 4,556meters, Mount Meru is the fifth highest mountain in Africa and is located in Arusha National Park. Late in the afternoon you will drive back to Arusha in order to stay overnight on your own arrangements. Flight tickets, Arusha accommodation, Tours to Zanzibar Island, Items of a personal nature such as passport, Visa, Traveler’s insurance, Alcohol, Medical evacuation insurance, Tips, Any airport pick up or departure transfers.